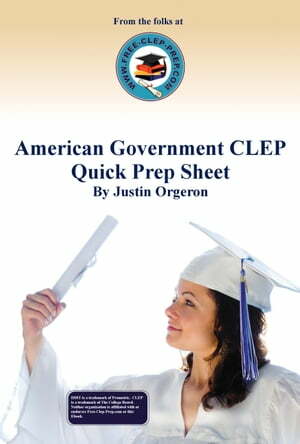 Collins Booksellers - American Government CLEP Quick Prep Sheet by Justin Orgeron, 9781935792048. Buy this book online. What is a Quick Prep Sheet? Basically, it&apos;s us doing 99% of the prep work for you. We&apos;ve taken input from the thousands of people who visit Free-Clep-Prep.com every day and put together a list of the terms and topics you&apos;ll need to know for the American Government CLEP. We do the research and then teach what you need to know in an easily digestible way. All you have to bring is your appetite to learn. We keep these Quick Prep Sheets small on purpose. Almost all of them are under 30 pages/10,000 words and there is no fluff or filler material included. If you&apos;re looking for a 200+ page book to read, we&apos;ve got some great recommendations on our free study guides. If you&apos;re a fan of flashcards, crib notes, or study sheets, then you are going to love our Quick Prep Sheets. Aside from a short intro and conclusion, every single word is there for one reason - to help you understand the material and pass your CLEP/DSST. Keeping it lean and mean also allows us to offer these at a fraction of what others are charging. Don&apos;t be put off by the price - Yes, we know it&apos;s ridiculously cheap and we&apos;re perfectly okay with that. Free-Clep-Prep is here to help you pass exams, not make a fortune. If we succeed at helping you pass, you&apos;ll tell others about us. Everyone wins. That&apos;s been our strategy for 4+ years now, and it&apos;s worked great so far. These take hundreds of hours to put together, but we&apos;re proud of the end result. Give our Quick Prep Sheets a try. You&apos;ll be happy you did! "Thank you! Thank you! Thank you! Just when I thought it couldn&apos;t get any easier with your incredible site! These prep sheets are awesome!" - Susan G.
"My DD used it (Astronomy Quick Prep Sheet) as her only study resource because the subject is one of her favorites. I studied with her by reading the definitions and she answered back with the terms.